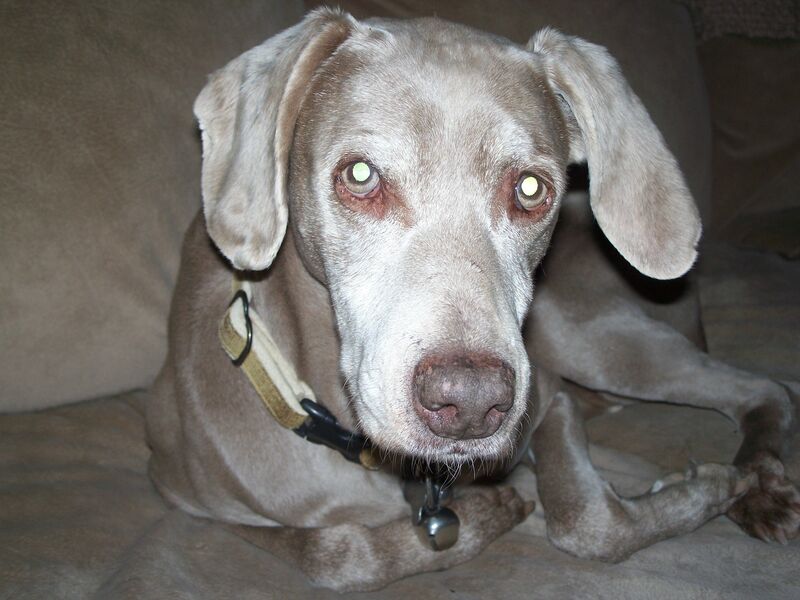 Sheena was our fourth Weim, adopted at age 10 from a rescue. She’d been found wandering a trailer park and eating out of trashcans. That dog could open a can of tuna with her teeth (as we discovered one day when she grabbed a can off of the counter)! Her owner had moved and the person who was supposed to be taking care of her didn’t. She had some lifelong scars and we’re sure life on the street was difficult. Sheena had been at the rescue for two years because she was “too old” and nobody wanted an old dog. Adopters prefer the youngsters, so the older dogs linger. Knowing this, we’d been looking to specifically adopt and help a senior Weim. She lived with us for four years until lung cancer took her from us. We miss Sheena and were so glad to be able to give her four great years of love. We hope that sleeping our our couch in climate-controlled comfort with regular meals helped make up for some of what humans had done to her earlier in her life. See you at the Bridge, Sheena!